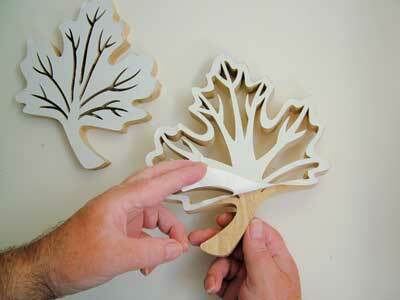 of practice in the basic skills of scrollsaw use. Since all of them are fairly straightforward, we have not graded them in order of difficulty - just choose those that appeal to you. These attractive trivets are quite simple to make, and will be a great addition to your kitchen or dining table. 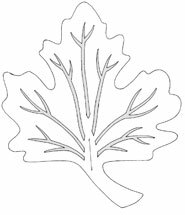 We give two variations on the same design, which are effectively 'negatives' of each other: one with the leaf veins left solid, and one with the veins cut out. Since they will be left in a natural state, an eye-catching hardwood will look best; in any case, the many sharp cross-grained projections would be very fragile in softwood. If you are new to scrollsawing, it is definitely worth practising these delicate cuts on a piece of scrap wood before you start on your chosen piece. 1 Photocopy each pattern to 9 1/2 x 8in (240 x 200mm). 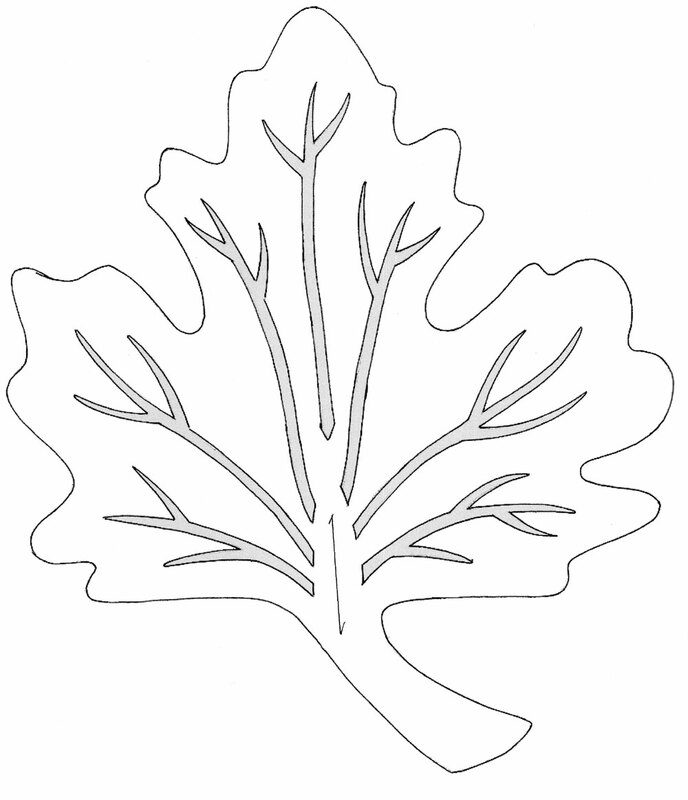 The areas to be cut out are shaded to avoid confusion. 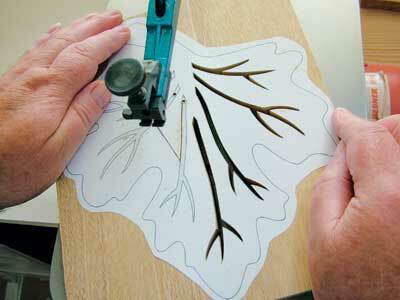 Using scissors, cut around each leaf shape, leaving a border of, say, 3/8in (10mm). 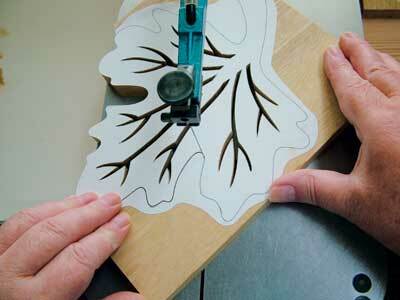 Look at the direction of the wood grain and position each leaf with the stem in line with the grain, not across it. 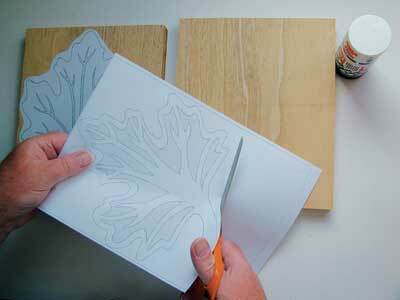 Apply an even coat with the glue stick over the whole area, then press firmly into place. 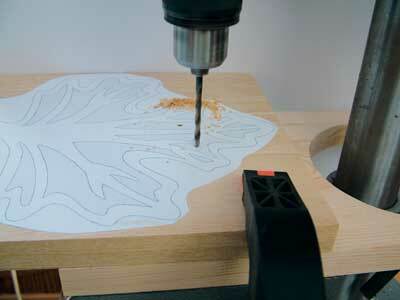 2 Fit the drill with the 1/8in (3mm) bit, and carefully drill a hole through each of the shaded areas to be cut. 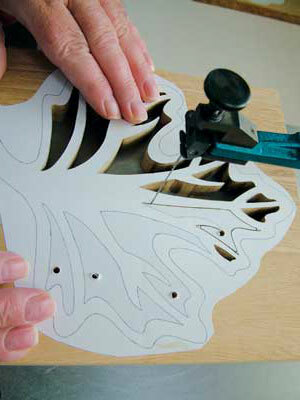 3 Pass the scrollsaw blade through the first hole, align and tighten the blade as described on page 17. 4 Proceed to cut out the first of the shaded areas, then each of the others in turn, rethreading and realigning the blade each time. With these tight corners, it's a good idea to cut into the V from one direction, then back the blade out just far enough to be able to turn and continue along the cutting line, then return to finish the cut once the majority of the waste has been removed. 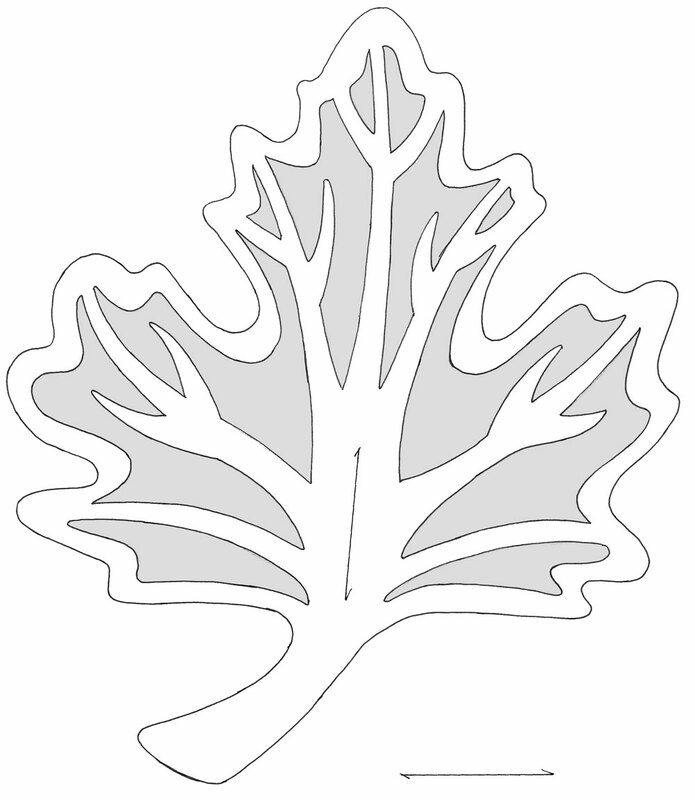 5 The cut-out areas in the second design are much narrower, but the technique is the same. Work carefully and do not rush. 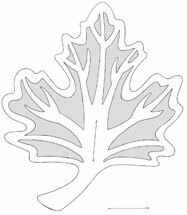 6 With all the shaded areas cut out and removed from both trivets, cut around the outer edge of each maple leaf to remove the waste. 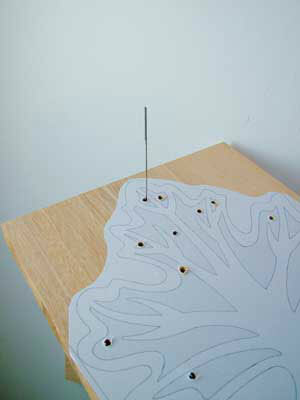 7 Remove the pattern; using a damp cloth to moisten the paper will help you to lift the pattern easily from the wood. 8 When dry, use a sanding block fitted with 180-grit sandpaper to remove any residue left by the glue, then hand-sand around the edges to remove the burr. Lastly, wipe the trivets with a tack cloth to remove the fine dust. 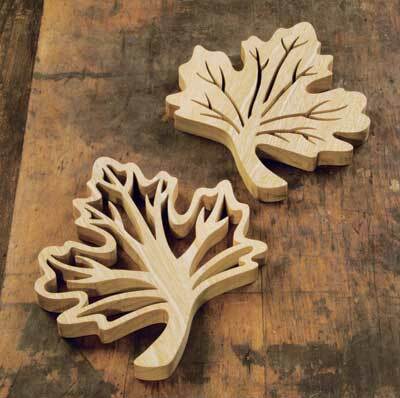 You can leave the hardwood trivets in their natural state. 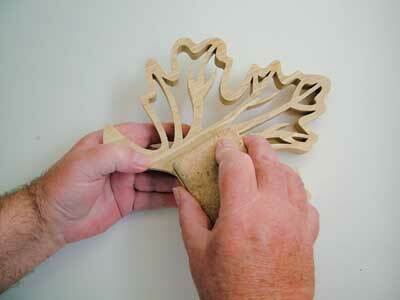 "It is definitely worth practising delicate cuts on a piece of scrap wood"
of love! Having a scrollsaw with variable speeds was definitely an asset, as cutting some hardwoods on a high speed can burn the wood badly and the burn marks are extremely hard to remove with hand-sanding alone. We would advise working on a fairly low speed - say 800–1000 strokes per minute, depending on your choice of wood - with an Olson no. 7 reverse-tooth blade, and cooling the blade with a fan if you have one handy, to keep the burn marks to a minimum. It may sound strange, but it does work.